Jorge Aguilar - Agon, born in Barcelona in 1936. After attaining a University degree, he left Spain for Europe and mixed with the Bohemian circles of the Schwabinger Kunstkreis in Munich and Parisian Montmartre and St Germain des Pres. His first exhibition was launched at The Medici Society in London and his reputation as an artist quickly grew into one of international recognition and repute. 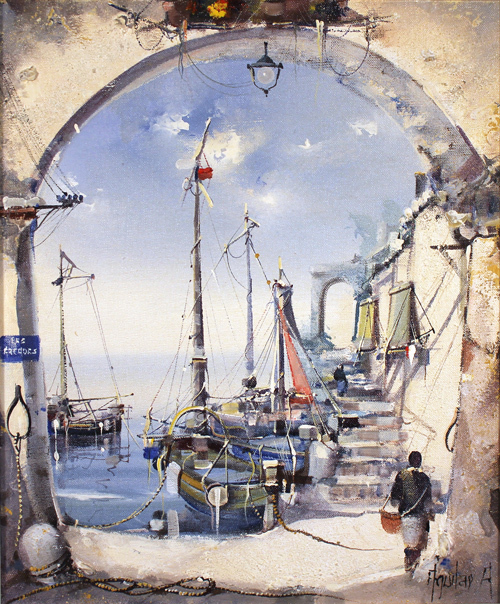 His distinctive style of painting reflects a personal record of his travels and to date he has had 8 highly successful world tours and over 182 individual exhibitions. 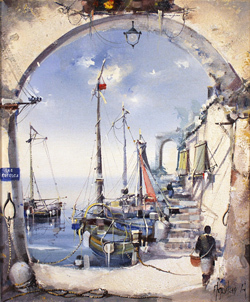 He holds an extensive list of award-winning Fine Art reproductions to his credit and has received some of the highest ranking academic awards and distinctions to be bestowed within artistic circles. Working from studios in France, Spain and England, he speaks seven languages fluently and is a regular contributor to Radio and Television art programmes. A founding member of the European Academy of Arts, his paintings are represented in exclusive private collections and museums all over the world and citations appear in several notable reference journals. Please note that all Jorge Aguilar Agon art listed in this section has previously been displayed for sale and is not currently available.